Doug Henwood offers an interesting comparison of the stock market performance of U.S. presidents (1945-present) by this point in each four-year term of office. 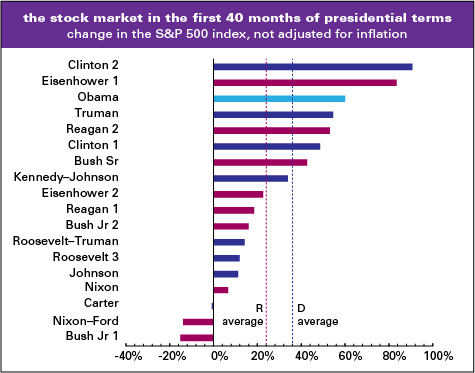 "Obama’s stock market is the third best," he concludes, "beaten only by Clinton’s second term and Eisenhower’s first. (See graph, below.) Adjusting for inflation has little effect on the rankings." As Henwood notes, "Since the beginning of Obama’s term in office in January 2009, the S&P 500 is up 60% -- twice the average of all the 18 presidential terms since Roosevelt’s third. (Adjusting for inflation, Obama’s score is three times the average.) These results are not particularly surprising. The 40-month average for Democratic presidents is 36%; for Republicans, 24%. Still, Obama’s 60% is nearly twice his party’s average." Again, this comparison applies only to the first 40 months of each presidential term. For an analysis that considers all years, see this post from a few weeks back. To summarize, based on a Bloomberg Government analysis by Bob Drummond, starting with the Kennedy administration and going through the first three years of Obama, the S&P 500 returned a cumulative 992% over the 23 years of Democratic administrations versus 109% over 28 years of Republicans.